Rensselaer's Graduate Student Mathematical Modeling (GSMM) Camp is a 4-day workshop whose aim is graduate student education and career development directed towards modern scientific problem solving. The GSMM Camp is designed to promote a broad range of problem-solving skills, including mathematical modeling and analysis, scientific computation, and critical assessment of solutions. invited Faculty and industry mentors bring problems to the Camp. These problems are highly interdisciplinary in nature, inspired by real problems that arise in industrial applications. The work on the problems is done by graduate student teams, each with the guidance of an invited mentor, so that scientific communication are an important and integral component of the work. In this way, the GSMM Camp exposes graduate students to real-world problems of current scientific interest, and provides a valuable educational and career-enhancing experience outside the traditional academic setting. The GSMM Camp operates hand in hand with the annual Mathematical Problems in Industry (MPI) Workshop, this year to be held at Worcester Polytechnic Institute. The Camp runs during the week prior to the Workshop and the students and mentors attending the Camp are encouraged to attend the Workshop as well. In effect, the GSMM Camp provides an additional problem-solving experience for graduate students as a warm-up prior to the Workshop. Further information about the Camp, including an online application, may be found at the Camp homepage. The Workshop on Mathematical Problems in Industry (MPI) has been an ongoing activity of the faculty and students of the Department of Mathematical Sciences at Rensselaer for many years. MPI is a problem solving workshop that attracts leading applied mathematicians and scientists from universities, industry, and national laboratories. The objective of the workshop is to foster interaction and collaboration between scientists and engineers working in industry and applied mathematicians at universities. The MPI Workshop is a lively, five-day interaction on problems of interest to science and industry. On the first day, the industry representatives present their problems to the whole group. These problems vary widely in nature from those requiring basic physical modeling to those requiring significant computation. For the rest of the week, the workshop participants break up into small working groups consisting of senior faculty and attending scientists, graduate students, and the industrial representatives, to discuss and tackle the problems in an informal setting. On the last day of the workshop, an academic representative from each group presents the results obtained and discusses possible future directions. A written report detailing the progress made during the workshop is prepared subsequently and sent to the industry representatives. Upon approval by the industry representative, the reports are posted online (see reports and their links below). The first MPI workshop was held at RPI in May, 1985, and has been held annually since then. The format of the workshop was based on the long-running Oxford Study Group with Industry held annually at Oxford University at the time, but now held at participating universities throughout England. The format has proven to be a successful one and has not changed significantly over the years. The first 10 workshop were held at RPI, but since then the workshop have been held at RPI and at other participating institutes. In 1995, the workshop was organized jointly with scientists at Los Alamos National Laboratory and held at the University of New Mexico. Since then, the workshop has been held at RPI and at a number of participating universities, including the University of Delaware, Worcester Polytechnic Institute and the New Jersey Institute of Technology. A list of problems brought to past workshops and links to the home pages appears below. MPI 2013 will be held at Worcester Polytechnic Institute. The following is a list of problems (with links to reports) brought to workshops since 1995. MPI 2012, University of Delaware. Droplet Stability and Coalescence, Pall Corporation. The Use of Viscous Shear in Air Bearing Gaps for Precise Web Tension and Temperature Control, New Way Air Bearings. Approximating Correlation Matrices, Standard & Poor's. Fuel Cell Assembly Process Flow for High Productivity, Bloom Energy. MPI 2011, New Jersey Institute of Technology. Matched Asymptotic Solution of Glass Temperature Profile During Optical Fiber Drawing, Corning, Inc. (report). MPI 2010, Rensselaer Polytechnic Institute. MPI 2009, University of Delaware. MPI 2008, Worcester Polytechnic Institute. Modeling Battery Electrode Properties, TIAX LLC (report). MPI 2007, University of Delaware. Simple Filtration using Porous Media, W.L. Gore Associates (report). Drawing of Glass Fibers: stability and time dependence, Corning Inc (report). Algorithms for Digital Halftoning, IBM T.J. Watson Research Center (report). Development of a Quaternion-Based Algorithm to Process Data in Robotics Applications, TIAX LLC (report). Mosaic on Map Generation for a Forward-Looking Camera, AMRDEC, Redstone Arsenal (report). Flow Diverting to Prevent Aerodynamic Buffeting in Hard Disk Drives, Hitachi GST (report). MPI 2005, Wocester Polytechnic Institute. Enhanced Leak Detection, Veeder-Root (report). Stability of the Oil-Air Boundary in Fluid Dynamic Bearings of Hard Disk Drives, Hitachi (report). Lubrication Layer Perturbations in Chemical-Mechanical Polishing, Araca Inc (report). MPI 2004, University of Delaware. The Capillary Interface under Lubrication Conditions, Hitachi Global Storage Technologies (report). A Network Model of Alcoholism and Alcohol Policy, School of Urban Affairs and Public Policy, Univ. of Delaware (report). Fluid Flow Properties in a Porous Media Air Bearing, New Way Precision (report). Multi-Phase Flow in a Thin Porour Material, W.L. Gore & Associates (report). MPI 2003, Wocester Polytechnic Institute. Optimal Wear for a Laying Pipe, Morgan (report). Need a Lift? An Elevator Queuing Problem, UTRC (report). Safe Fuel/Air Slow Compression, Veeder-Root (report). 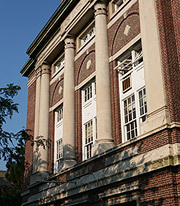 MPI 2002, Rensselaer Polytechnic Institute. Dynamic Modeling and Analysis of Accumulators in Vapor Compression Systems, UTRC (report). Mathematical Models for Effective Smile Management, Bear Stearns (report). Dynamics and Models of Thermo-Acoustic Instabilities, UTRC (report). Mathematical Modeling Issues in Chemical-Mechanical Polishing, Motorola (report). MPI 2001, Rensselaer Polytechnic Institute. Boundary Layers and Material Deformation in Fiber Drawing, Corning (report). Symmetry Breaking in Jetting, Xerox (report). Multi-name Credit Derivatives, Nomura (report). Shape Optimization of Pressurized Air Bearings, IBM (report). MPI 2000, University of Delaware. Options on Baskets, Numerix (report). A Water Wave Interaction Problem, Vehicle Research (report). MPI 1999, University of Delaware. Shape Optimization of the Read Coil Used in Hard Disk Drives, IBM (report). Modeling of Epitaxial Semiconductor Crystal Growth on Patterned, Masked and/or Structured Substrates, AstroPower (report). Interference Filters for Thermophotovoltaic Applications, KAPL (report). The Dynamics of a Roll Press Nip, Albany International (report). MPI 1998, Rensselaer Polytechnic Institute. Analysis of Vapor and Liquid Flow in Packed Columns, BOC Gases (report). Particle Deposition on a Loaded Fiber, Donaldson Company (report). Measurement of Modal Power in Optical Fibers, Corning (report). Reverse Pumping in a Rotary Lip Seal with Microundulations, Rockwell (report). Pressure Drop in Chromatography Columns, BIOGEN (report). MPI 1997, Rensselaer Polytechnic Institute. Optimization of a Flexible Cable, IBM (report). Bond Default Correlation, Merrill Lynch (report). Gas Concentration Measurements in Underground Waste Storage Tanks, Pacific Northwest Laboratory (report). Kinetic Modelling of Multicomponent Electrowinning, Los Alamos National Laboratory (report). MEMS Diffraction Grating, Interscience (report). MPI 1996, Rensselaer Polytechnic Institute. Sintering of Non-Uniform Porous Materials, Corning (report). Retrieving Pore Size Distribution from Bubble Flow Data in Porous Membranes, Pall (report). Annular Two-Phase Flow, KAPL (report). The Design of Hard Drive Slider Bearings, IBM (report). Optimizing Membrane Separations of Two-Component Protein Solutions, Genentech (report). MPI 1995, University of New Mexico. Determination of Index Data from Refracted/Diffracted Rays, Corning (report). Gas Jet Cleaning of Filters, Pall (report). Cracks in Laser and Arc Welds, Rockwell (report). Large Gas Release Events from "Dry" Waste Tanks, Pacific Northwest Laboratory (report). Reducing the Cost of Monte Carlo Analysis of Well Logging Data, Chevron Petroleum (report). Uncertainty in the Solution of Porous Media Flow Models, Golder Associates (report).